Feeling cold ? have chai (tea) . Want to have a important conversation ? Meet up at chai. After all , who says chai cannot be the solution to your every problem. Chai is the most loved beverage among India and the love indeed doubles when it comes to Delhiites. 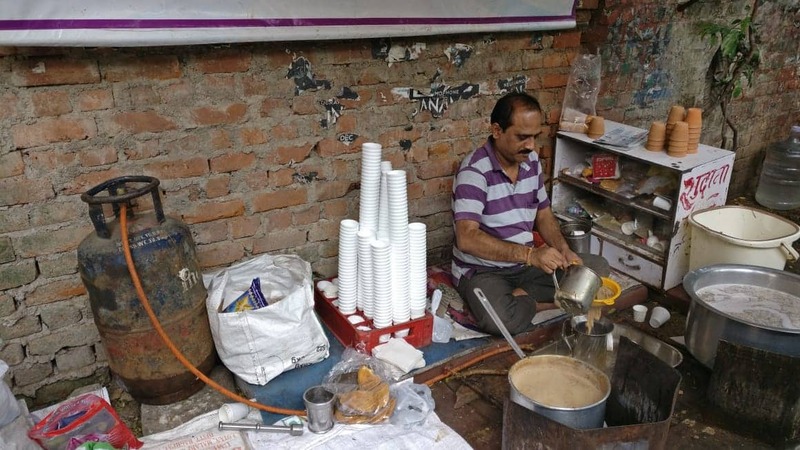 One such place which was established around 30 years ago by a very humble man popularly known as ‘Sudama ji ‘ by his fellow customers , is “Sudama ji ki Tea Stall” which is located right on the main road from Kirori Mal College to Ramjas College. At any mentioned time of the day you will see people flooded on this tea stall, there doesn’t exist a single person in the North Campus who doesn’t know about this stall. Once you name it and people will tell you the exact spot where it is located at. Sudama ji serves his special tea at as low as Rupees 10. You can taste the flavor of ginger, cinnamon and cardamom in the masala chai he offers. The best time to visit this place is the late evening hours especially during the winter nights, you will see every person including the cops patrolling around the area to the students living in the campus to the staff and even the fellow rickshaw and auto drivers breeding around the stall waiting for their chance to get a glass full of the ‘most talked about ‘ chai of the campus. This stall stays open until late night with never ending rush for chai which can always be seen boiling down in big vessels by Sudama ji with a lot of passion to make his chai perfect for his customers. You can also have some rusks , biscuits to accompany the perfect cup of tea even to make it more perfect. While crossing through the university you will always listen people mentioning this tea stall and especially students quoting it very often. 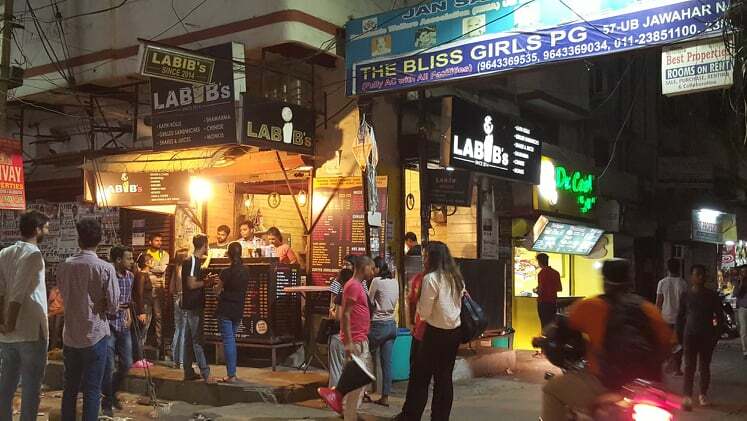 So, if you are on a search of a perfect cup of ‘garma garam chai’ along with a swarm of people who are equally passionate and in love with chai as you are or else need a perfect kick start to your day or want a much needed break then surely this is the place you are searching for. Who with pizza covered in loads of cheese and topped with freshly made pizza sauce and toppings is poor? Pizza is not a food but it’s an emotion. This world was blessed with its first pizza in the year 1889 , ever since the true love for pizza in people’s heart has not faded and in fact it grew stronger with time. 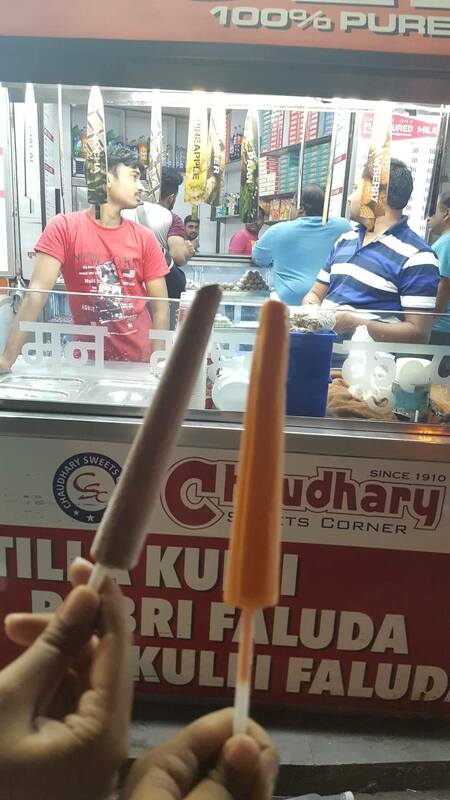 When it comes to pizza, what is better than a small roadside stall which offers a huge variety at a low cost ? 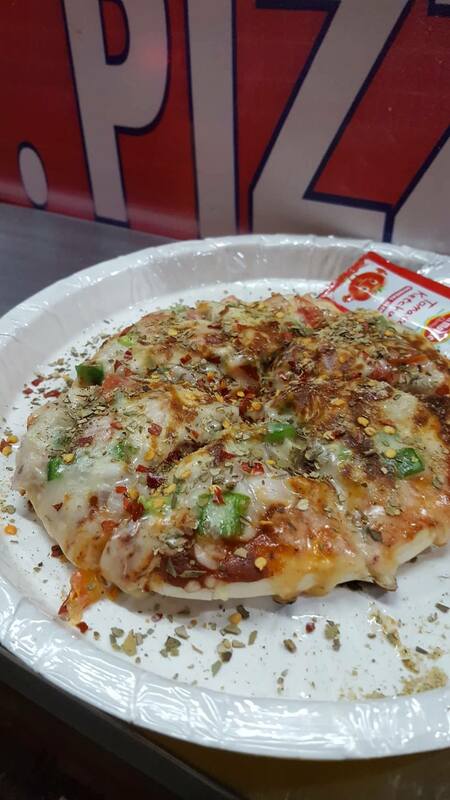 One such stall resides in the cooks and nooks of Kamla Nagar which is called ‘ SPW Pizza’. It offers a huge variety which includes mushroom pizza, four cheese pizza, paneer pizza, capsicum pizza etc. During a chit chat with the vendor at SPW Pizza Stall he told how SPW has various branches spread all over Delhi including in Rohini, Ghantaghar, Gtb Nagar etc. This may be not the most heard place to have a pizza but believe me the taste and quantity which this place offers is unmatchable. A perfect crust of pizza is topped with loads of the selected toppings and spicy pizza sauce along with plenty of cheese and of course the oregano and chilly flakes. Your mouth explodes with flavors as you gulp in the first bite of the delicacy which this place offers, first you feel the hotness of the seasoning and then creamy taste of cheese accompanied with the perfect twist of the pizza sauce and the toppings. Along with the good taste, the service is appealingly fast and flawless. Even if you are not feeling that hungry this place has a solution for that too, the ‘baby pizza’ which is just the right size to satisfy your baby hunger. Apart from the good taste , good service and economical prices they also have the delivery service which is very convenient and worthy. If you consider pizza as your soul food and posses an endless love for it, this is surely the right place to make your heart , taste buds and stomach satisfied with the delicious and drool worthy pizzas it offers. 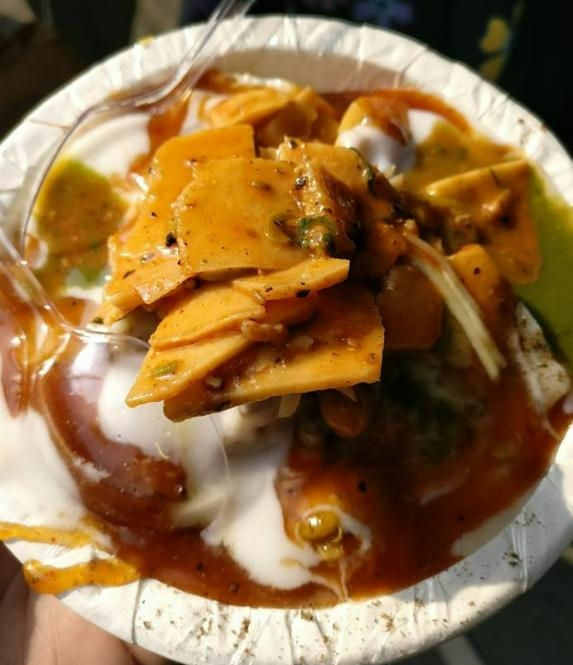 Every Dellhite’s favourite street food is Chhole Kulche! 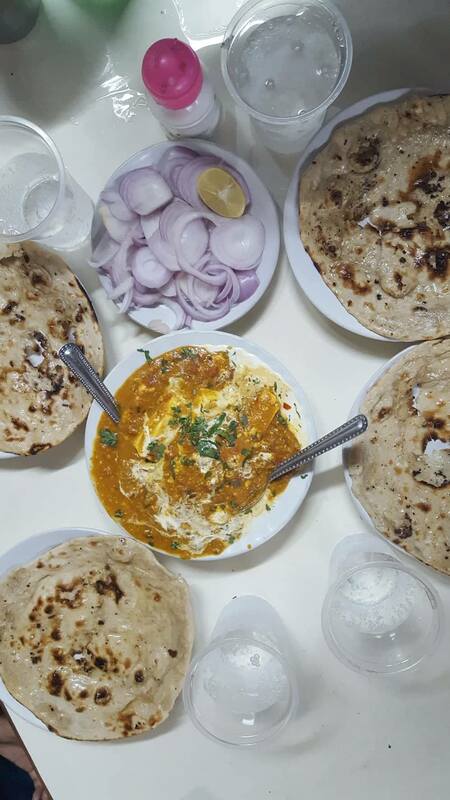 It is one of the most celebrated go-to food of Delhi and everyone has a favourite local joint. 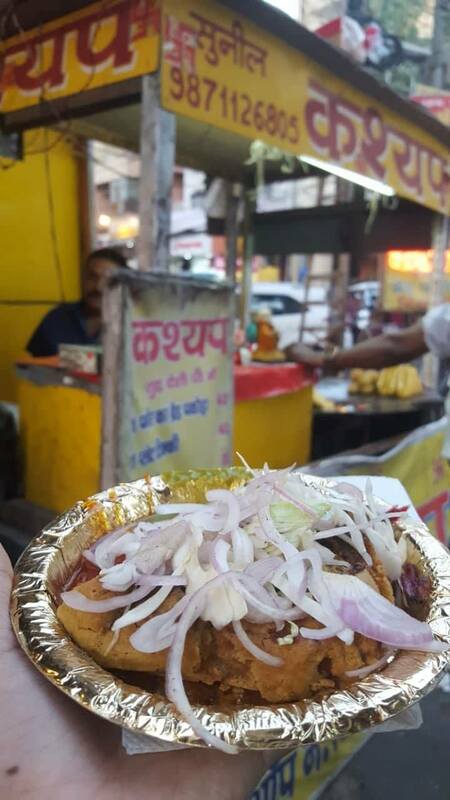 Recently, on the recommendation of my foodie friend, Karan, I tried a very different kind of Kulche chole in Azadpur. The name of the Chhole Kulche joint is Dinesh ke chole kulcha va garam pulav. 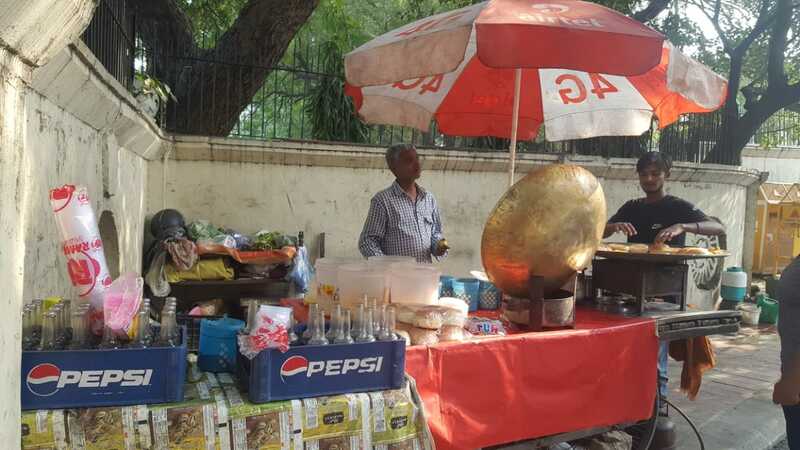 Located next to Akash Cinema, Azadupur, it is easy to spot, because of the hordes of people surrounding his cart. The cart is owned by Dinesh and managed by his two brothers Kuldip and Raju. The family hails from Bareily in Uttar Pradesh and they have been into this business for the past 25 years. This joint has a distinctive and exciting way of making kulchas. The kulchas are fried in butter with a red curry- a mixture of tomato, onion, garlic, ginger and capsicum. First, a generous amount of oil is put on a big pan and the red puree is added with a bunch of different spices. The kulchas are then fried over the spice mixture on the pan. A big spoon of butter is then spread over all the kulchas. The kulchas are spicy and delicious, with a unique spicy punch that adds to the flavour. I ate few of them with out the chole. Infact, I asked him for double masala fry to make it more spicy. The kulchas are not for the weak hearted because of the amount of butter and spices that are added to the kulcha. However to soothe it down, a glass of boondi raita is served at Dinesh’s stall. After the initial conversation, Kuldip and Raju shared that the frying of kulcha is inspired from Pav bhaji where the buns are fried in a thick gravy with butter. The joint is extremely inexpensive at only 30 rupees a plate. After relishing the kulchas at Dinesh’s stall in Azadpur, I headed to his Uncle’s Chole Kulcha shop in Naraina. I was warned by Kuldip that it would be over by the time I reached. Keeping my fingers crossed I drove straight to his place, asking the security guards in the residential colony of E block, Naraina for his shop. The complete address is E-195, Naraina Vihar, Near Gyan Mandir Public School, Mobile number- 9211863472. By the time, I reached, the chhole at his stall were already over but on request I got a small portion of Chhole and a few kulchas. 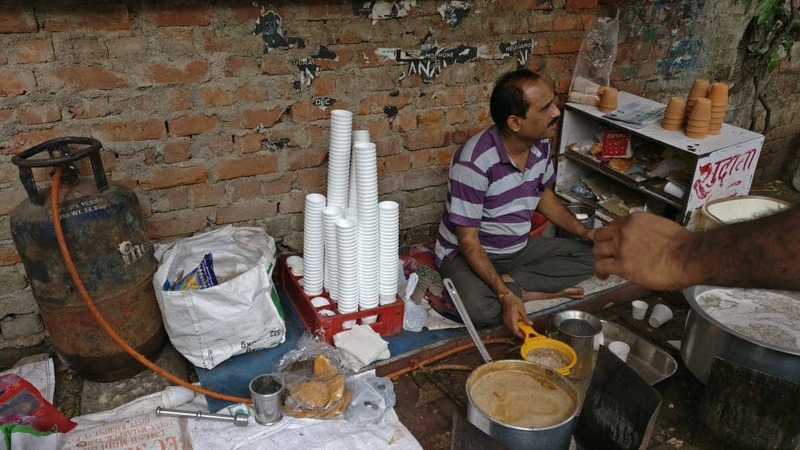 Kanshi ram, who owns the shop, migrated to Delhi from Bareily at the age of 7 . When I visited his shop, he was listening to folk songs through his headphone, and sitting relaxed savouring tamatar pyaaz chutney with roti. I spoke to him at great length. His eyes were glistening with pride while he shared his story of hard work towards success that began from being a small street vendor to owning a ig shop. Kanshi ram, also, has a similar way of making the kulchas. He puts butter over a big pan, fries the kulchas, spread a spoon of red coloured chutney, a mixture of garlic red chillies and tomatoes, and garnish it with grated paneer. 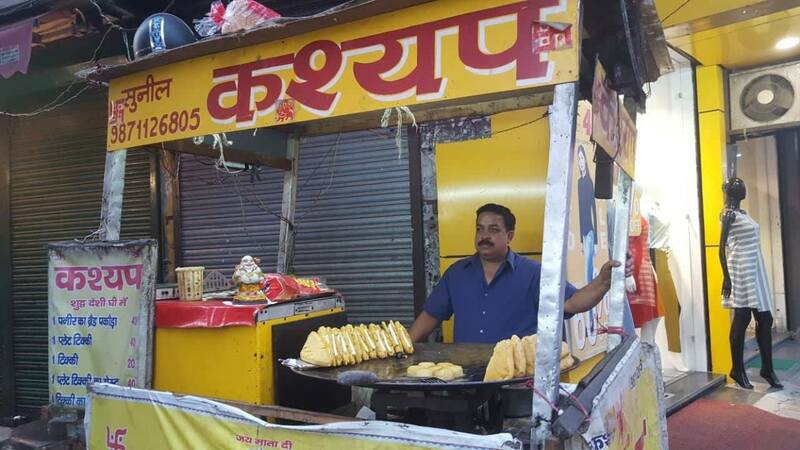 However, it lacked the spicy punch that was evident in kulchas at Dinesh’s stall. This is because of the butter and paneer that makes it less spicy compared to Dinesh’s kulche. Nonetheless, if you like your kulcha to be more spicy, you can ask for more chutney separately. 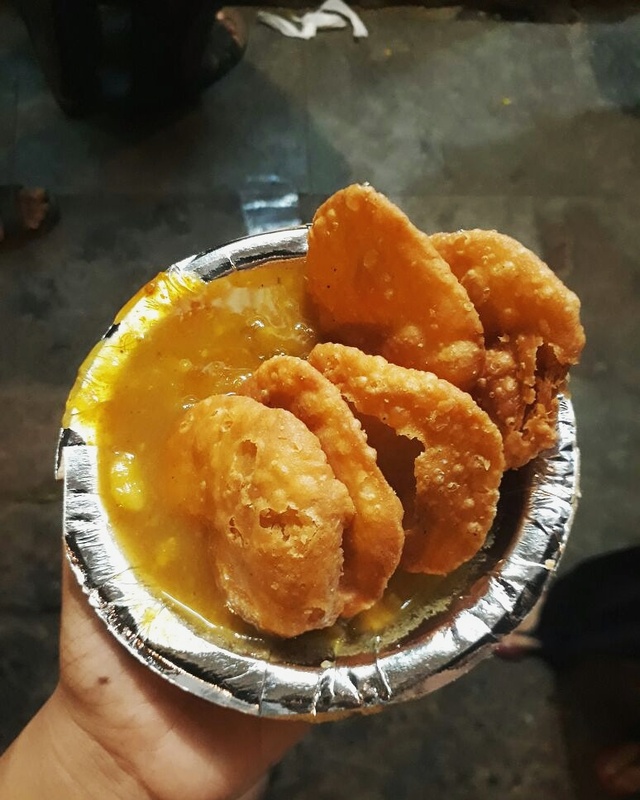 A plate of Kulche Chhole costs Rs 40 at Kanshi Rams stall. After having my fill, I bid adieu to Kanshi Ram and got the invitation at the same time to try the mutton he prepares, which he is going to cook sometime specially for me. I really liked the two joints and I hope they are able to expand across Delhi!